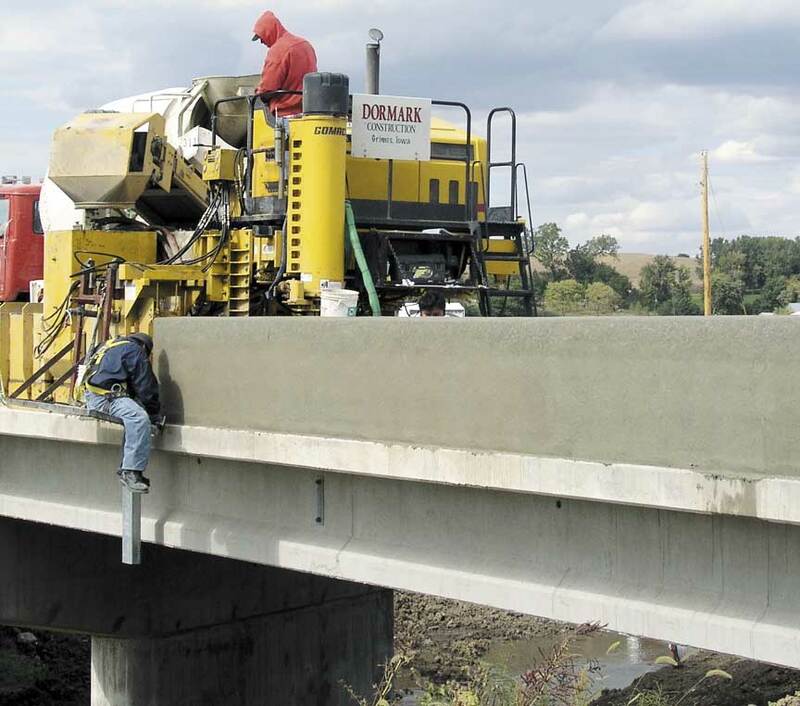 Dormark Construction, based out of Grimes, Iowa, specializes in slipforming bridge parapet. They have a GT-6300 with a barrier mold and they travel with their machine across Iowa and four of the surrounding states. Just last year, they purchased another machine, a Commander III, and it's been working non-stop pouring wall ever since. The Commander III, according to Dormark, is an ideal machine for wall work and they utilize many of the machine's features. A steady, smooth working speed, All-Track Steering and Selective Steer are just a few of their favorites. "The Commander III is just an excellent machine," Russ Vetter, concrete paving superintendent for Dormark, said. "For us, it's not how fast it can go, but how smooth it is at low operating speeds. When you're pouring a barrier, you're going at a particularly slow rate and this machine is incredibly smooth at a slow speed." On a recent project near Holly Springs, Iowa, the company slipformed parapet for two separate bridges, approximately 600 feet (183 m) of parapet. The wall is a state of Iowa standard 34 inch (864 mm) tall parapet over continuous steel reinforcing. Stringline setup is an important aspect of their work and Dormark has developed a unique method for measuring its placement. 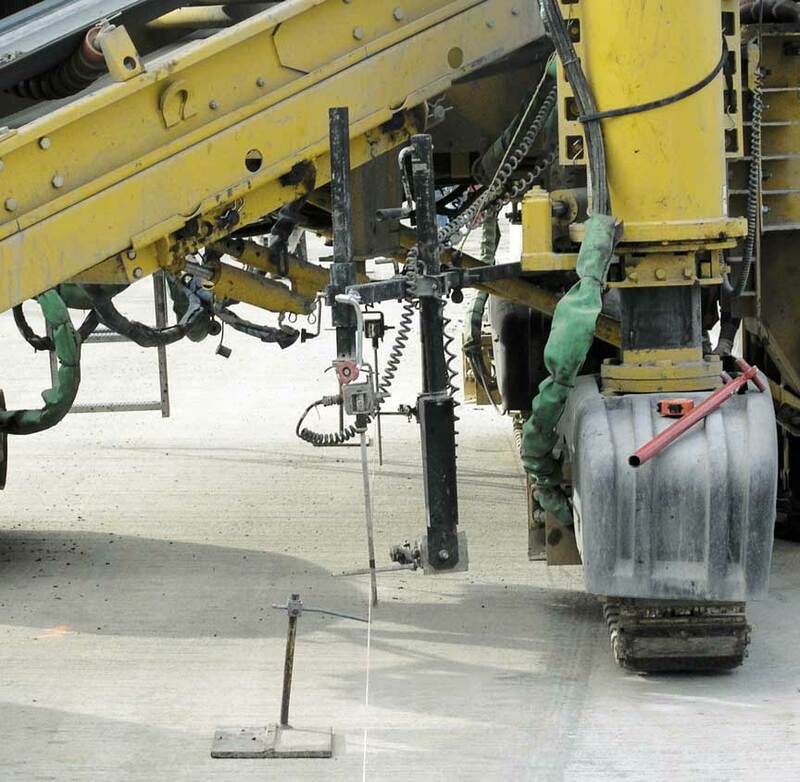 "Normally you're told to set the stringline off the edge of the bridge," Vetter explained. "What we do is measure off the inside bar of our steel. Once it's set, we go back and eyeball the string and make it straight. This way the steel stays centered in the wall and the machine is pouring the wall so it will follow that steel and keep it in the center." Their sensor placement also varies from the norm. They prefer to run their sensor ahead of the front leg instead of positioning it in front of the mold. "Having the sensor in front makes that track stay on line that much better and the less that track has to work, the better off we are," Vetter said. 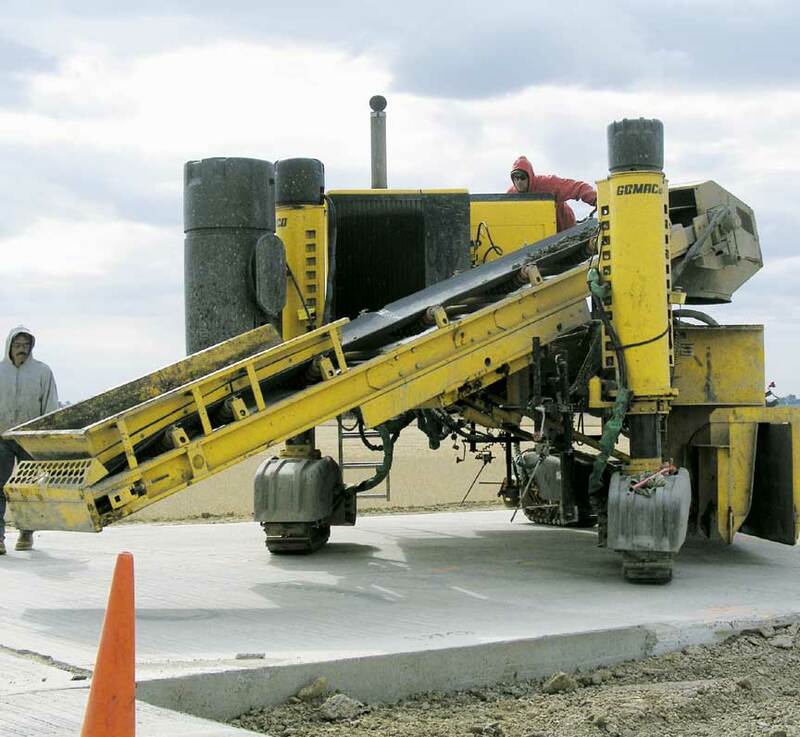 They use a state of Iowa D-57 concrete mix that contains 15 percent Type-F fly ash and a percentage of water reducer to help increase the air content. Slump averages 1.25 inches (32 mm). Speed isn't a factor in completing their work and the production rate doesn't dictate their standard of quality. "We did a 44 inch (1118 mm) full median wall in Des Moines recently and we averaged 1400 feet (427 m) in a 12-hour day," Vetter said. "It's really not how fast you can go or how much production you can get down in a day, it's the quality of the work that you put out. 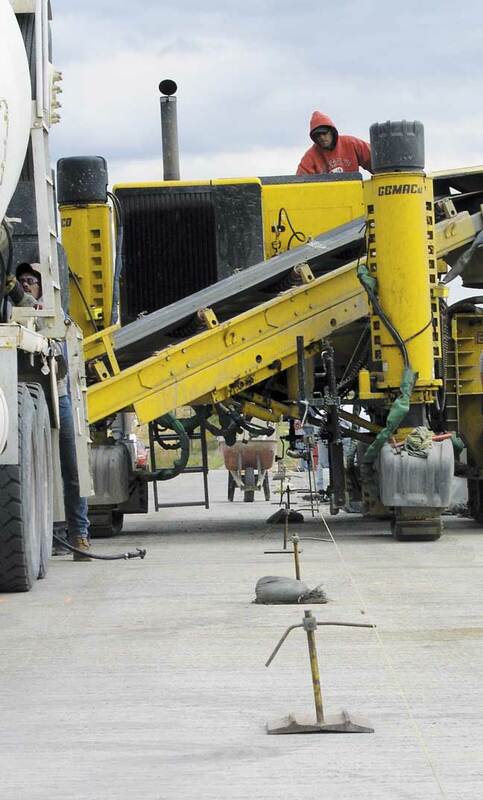 You don't want to go any faster than your finishers can keep up with or any faster than your concrete supply." They also need a machine on their projects that is easy to maneuver. Once one side of bridge parapet is slipformed, the machine has to be taken off line, turned around, put back on line, and be ready to pour the second side. Most of the time, this maneuvering has to be done in tight conditions with little room to move. "Selective Steer is an invaluable use on this Commander III," Vetter said. "We can turn the machine around on a dime and All-Track Steering gets us back on line in no time. Crab steer, rear steer, front steer... the machine just steers itself up to and on the stringline." Work behind the machine is kept to a minimum. Workers apply a broom finish and apply curing compound. No expansion joints are necessary on these two bridge decks near Holly Springs because of their short lengths. The bridges were finished in less than two days and the Commander III was loaded up and headed towards its next project in Des Moines. No matter what the size of the project they're slipforming, Dormark has a few simple rules that they follow every time to ensure success. "You have to take the time to know your job site in advance... what it looks like, logistics of it, getting your ready-mix trucks in, scheduling your concrete, and knowing if there are going to be any obstacles that will come into play," Vetter said. "Little things like that can add up to big things in the end. Working with a GOMACO machine is fantastic, too. GOMACO builds an outstanding product." Dormark Construction slipforms 34 inch (864 mm) tall parapet wall with their Commander III on two bridges near Holly Springs, Iowa. Dormark positions their sensor ahead of the front leg instead of positioning it in front of the mold. They feel that because of its placement there, they get a much better product out the back of the mold. The Commander III’s Selective Steering allows Dormark to maneuver the machine around tight job-site conditions.